Set actions enable richer, more flexible analysis for end users. But did you know that you can empower business users with interactive statistical tools by pairing set actions with advanced analytics capabilities such as correlation, clustering, and percentiles? 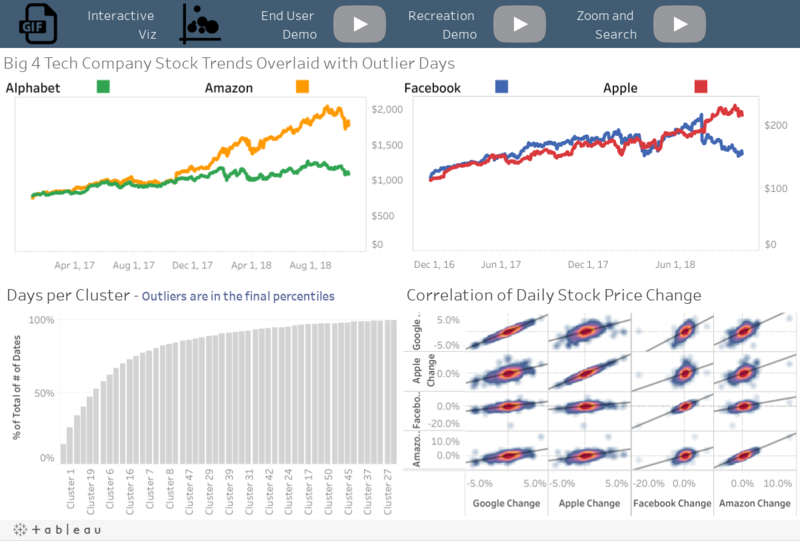 Through simple visual interactions in Tableau, you can spread the expertise of trained analysts and data scientists broadly across your organisation. For an introduction to set actions, see 8 powerful comparisons with set actions and 8 analytic concepts to express with set actions. 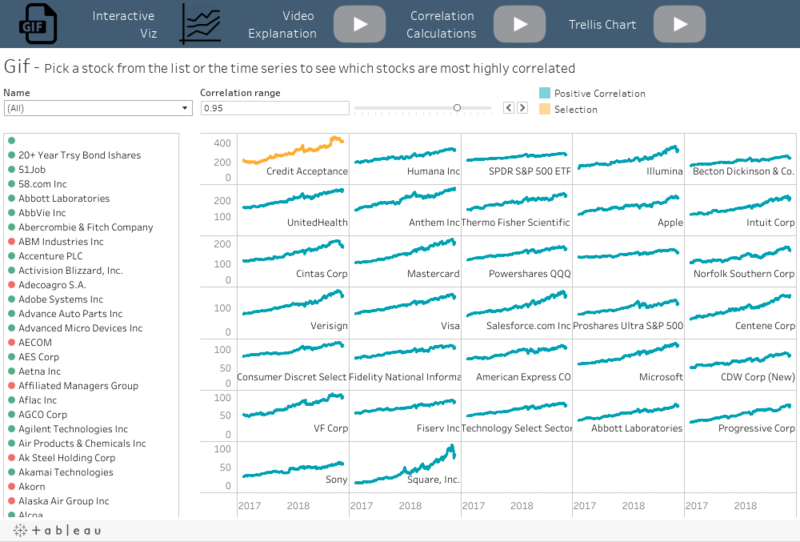 In the following example, a set action captures the selected stock, a conditional calculation returns the corresponding time series, and a level of detail expression correlates its daily close value with all other stocks. A filter then restricts the stocks to the subset within the specified range. I applied similar techniques in these Difference from Underlying Average and Difference in Change examples. Cluster analysis is a statistical technique for grouping data points based on a multiple attributes, such that the data points within the same group are more similar to one another than those in other groups (clusters). In addition to grouping, you can also apply cluster analysis to outlier detection. If a particular cluster has very few data points, it indicates that those data points are dissimilar to most other data points, and may be outliers. For example, when analysing market trends over time, you may expect similar companies to have related changes in the stock price, as they are impacted by similar market forces. Days where the change in direction or magnitude of a particular stock differs greatly from others may be classified as "outlier days," as this could be an indication that a particular event impacted that company without impacting the market in general. When analysing tech stocks, you can identify days where notable events may have occurred by selecting the clusters with the fewest number of days. In the example below, you can find this information in the “Days per Cluster” visualization. With selection (through set actions), an end user can interactively explore normal versus abnormal days. Data analysis often requires users to compare the relative difference between measures. While the absolute difference applies to measures on a common scale, a distributional difference is more suitable when comparing values on different scales. For example, when analysing World Cup Rankings, a user could ask the question, “How far did each team’s results deviate from historical FIFA rankings?” This question may actually be more challenging than you would think because there are only 32 teams in the World Cup, while FIFA ranks all teams in the world. Let’s say a team ranked 32nd in the 2018 World Cup and their FIFA rank is 32nd globally. That does not mean performance was in line with expectations; it means they performed worse in the World Cup than in general. A percentile calculation transforms a measure from a range into a distribution, allowing for the comparison of different ranges on a common baseline. 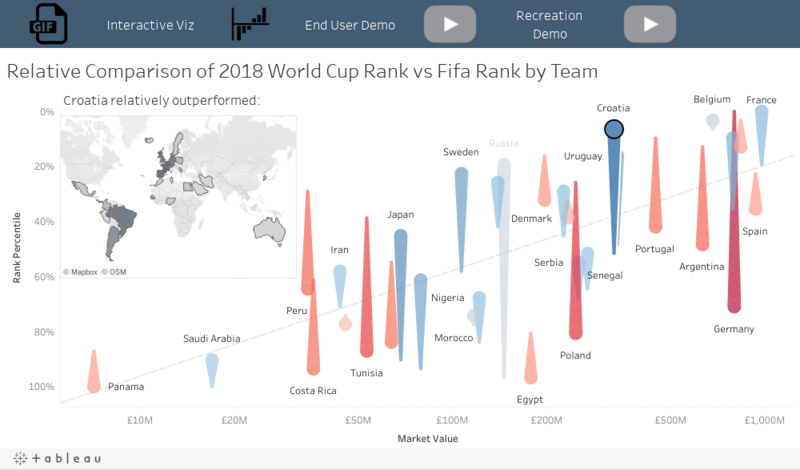 With set actions powering interactive computational analysis, Tableau can compute and display a visual showing teams that were relatively outperformed by the selected team. Composing statistics, visual analysis, and interactive data computation in a single web interface exposes the power of statistics to business users. While many applications can achieve one or two of those capabilities, the power of Tableau lies in its ability to accomplish all three in a single interface.